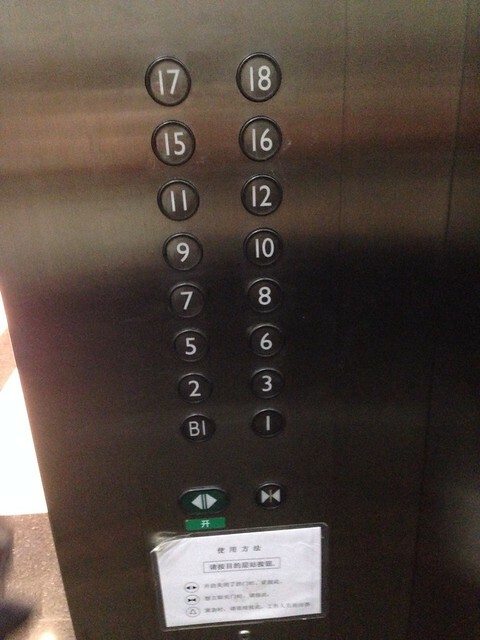 > Enter a Hong Kong residential tower elevator and you’ll often discover buttons for floors labeled 3A, 12A and 15B–no doubt alternative universes guarded by daemons and fairies. Other times the 1st floor is renamed the “ground floor” (following British conventions) and the 2nd floor is counted as the 1st floor, so then the 3rd becomes the 2nd and abracadabra! — the dreaded 4th floor becomes the less deadly 3rd floor right before our very eyes. Problem solved. > Whenever a lift whizzes past the imaginary gaps between the 3rd and 5th floors or the double gap between the 12th and 15th floors, I’m taken by cleverness of it all. A property agent can show her clients a breathtaking flat on the “16th floor” without admitting it’s only 13 floors up. Sweet–higher rent and nobody dies. So depending on your perspective, apartment 4D at 1441 West 14th Street is either a deathtrap or the bargain of a lifetime. I say drop that cash and grab that key. It’s linguistic yes, but is this other example related in a way? … I read that pink used to symbolize masculinity in the 18th century up until the 1920s. Now it’s reversed. I’ve seen the same thing in Japan. No 4s and no 13. Thanks for the shout out, John.